You've certainly heard Artemis mention Rule 63 before; this set is all about it. BSG's Admiral Cain was based on war hero Commander Cain from the original series - who was played by Lloyd Bridges. The sadistic martinet Helena Cain was played by Michelle Forbes (best known for playing Star Trek's ensign Ro Laren), and the Minimate's likeness is stunning. They even got the small mole on the side of her chin! Her hair is a new piece, and she gets a sculpted jacket. There are blue stripes on her sleeves, and an insignia on her left shoulder. She gets one accessory: a blue book. When it comes to gender-swapped characters, Starbuck drew the most attention. Because apparently there was a character in the original series with the same name, and he was a man. Specifically, Faceman from the A-Team. 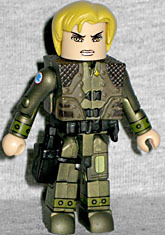 Anyway, this is the real Starbuck, though the likeness isn't as strong for Katee Sackhoff as it was for Cain. 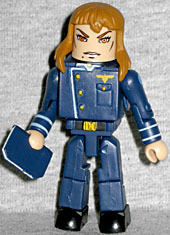 This is an angry, mopey Starbuck, which suits the later seasons, but by then she was no longer a lieutenant. She's wearing her Viper pilot suit, so the figure is painted in a slightly metallic green, with lots of tampographed details on the limbs. She has a new belt, and a really ornate flight jacket that was easily one of the most complex sculpts a Minimate had ever seen by that point. Her accessories include a holster, a Colonial sidearm, and a flight helmet. You have to remove her hair, obviously, but the helmet looks great. Word of warning, though: it fits on the head very tightly, and you might have trouble getting it back off again. I scraped all the paint from the inside, cut out the head-peg, and it still sticks half the time. Not as bad as Iron Man, though. There is, as I learned from Shocka, a whole contingent of old-school purists who think the new BSG is an insult to the original series. And honestly? Good. Insult the hell out of it. The original Galactica was a total crap-heap of a show, and the new one is better in every way. Cain and Starbuck are women now? Big whoop! The Minimates of them look really good, and strike a nice balance beteen painted details and new sculpts. This entry was posted in Art Asylum, MMMR and tagged BSG, Minimates. Bookmark the permalink.